Russia's hybrid military forces attacked Ukrainian army positions in Donbas 82 times in the past 24 hours with five Ukrainian soldiers reported as wounded in action (WIA), according to the press service of the Anti-Terrorist Operation (ATO) Headquarters. 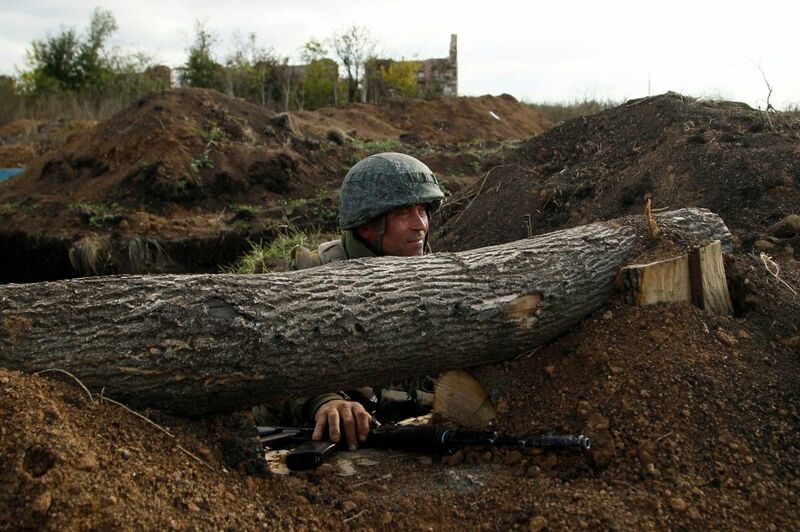 "In the Mariupol sector, the occupiers fired 120mm mortars on the Ukrainian positions near the towns of Maryinka and Krasnohorivka, and the villages of Shyrokyne and Novotroyitske. In addition, Shyrokyne was attacked with a tank. The Russian occupation forces also used 82mm mortars, heavy machine guns and grenade launchers against the village of Hnutove, as well as infantry fighting vehicles and tripod-mounted man-portable antitank guns in the village of Vodiane. Furthermore, the villages of Pavlopil and Chermalyk came under fire from large-caliber machine guns and grenade launchers of various systems," the report says. Read alsoOne of "DPR" founders dies in Donetsk – mediaIn the Donetsk sector, the situation was tense in the town of Avdiyivka, where the enemy opened fire from small arms, heavy machine guns, grenade launchers of various systems, mortars and tanks. At about 19:00 Kyiv time, the militants also started using Grad MLR systems. The occupiers fired 82mm mortars on the Ukrainian fortified positions near the villages of Nevelske, Verkhniotoretske, Zaitseve, Opytne and Kamianka, as well as infantry fighting vehicles and tripod-mounted man-portable antitank guns on the defenders of Butivka coal mine. Moreover, 120mm mortars were used to shell the village of Luhanske. Read alsoEnemy subversive groups active in ATO zone – IntelIn the Luhansk sector, the Russian-backed invaders fired heavy machine guns and grenade launchers on the Ukrainian positions near the villages of Valuiske, Novo-Oleksandrivka and Novozvanivka, and 120mm mortars near the village of Krymske. The ATO forces fired back to decrease the enemy fire intensity.